Experience cruising like never before. Crystal Serenity is the largest luxury cruise ship at sea. Crystal Serenity is the largest and most glamorous luxury vessel to sail the seas. Launched in 2003, a recent grand renovation and updated features keep it feeling modern. Passengers can expect exquisite design, a sophisticated on-board environment and an impeccable level of service. 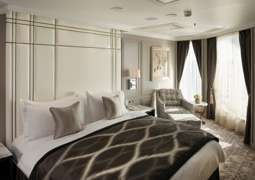 Its extravagant state-of-the-art features include a Feng Shui inspired spa, new “Perfect Choice” seating at mealtimes, and hypoallergenic staterooms. But beloved cruising traditions, such as classical music at tea time, tuxedos and ball gowns on Formal Night, and poolside sun lounges live on. The Crystal Serenity mostly undertakes long-term journey to exotic locations worldwide, attracting a clientele of loyal, mature adults who appreciate the unique locations and the onboard culture. Its Alaska and Caribbean cruises are becoming increasingly popular among families, and it also offers a high number of themed cruises. 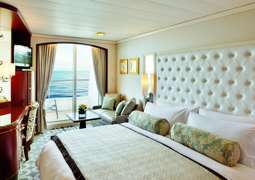 Crystal Serenity offers a range of luxury staterooms. 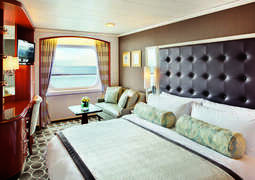 All staterooms are facing the outside, and 85% have a balcony. Stateroom sizes start at 226 square feet, making them among the most spacious on the market. Passengers can expect nice touches such as 100% Egyptian cotton sheets, inclusive internet access, luxury bath amenities and more. The Crystal Serenity has twice as many luxury penthouses as its predecessor, the Crystal Symphony, and each one measures up at an extraordinary 1,345 square feet. The penthouses feature such additional services as a personal butler, complimentary refreshments, unlimited Wi-Fi, and more. All passengers can enjoy 24/7 in-room dining – even from the specialty restaurants. Dining on the Crystal Serenity is an experience in and of itself. Even the buffet has a gourmet menu that changes every night. The Crystal Dining Room serves a combination of experimental and traditional dishes. Guests can glimpse into the world of molecular gastronomy with out-of-this-world culinary creations, or stick to classics such as salad and steak, expertly prepared. One dining experience not to be missed is Tastes, a specialty restaurant bringing new takes on traditional international dishes. The small plates allow you to sample up to 15 different dishes from around the world, all during one meal. The Serenity features a broad range of activities aimed at sophisticated adults. Classical quartets accompany afternoon tea, and the atrium, bars and lounges are accompanied by light piano music. Broadway-style musicals, live musicians and comedians keep even the longest sea days from growing dull, and dancing and karaoke are popular pastimes in the evenings. Additionally, themed cruises will typically include a free educational activity series about sports, music or the travel destinations on the current sail. Passengers on the Crystal Serenity typically dress more formal than on other cruiselines. Daytime wear ranges from smart casual to resort elegant, and passengers tend to choose evening wear for dining out, Formal Night or not. As with other luxury cruise lines, Formal Night is seen as a chance to go all-out, with men wearing sophisticated tuxedoes and ladies in evening gowns. Crystal Serenity is a cruise ship owned by Crystal Cruises and is known quite simply as the most luxurious cruise vessel in the world, Crystal Serenity is consistently awarded the highest accolades by the readers of Luxury Travel Magazine or among others. At 68,000 tons and capable of serving 1,080 passengers, the Serenity is Crystal Cruises’ largest ship. Her maiden voyage was a 14-day round-trip cruise, departing Southampton and sailing Northern Europe. Some spectacular destinations of the Serenity include Asia, Australia and New Zealand, South America and these are just a few of many options you have when choosing Crystal Cruises. The Crystal Serenity is one of the most enjoyable ships from Crystal Cruises. If you enjoy fine dining that defines all odds, Crystal’s Serenity is the place to be. Variety is definitely the buzzword when it comes to dining onboard the Serenity, their best chefs are engaged in preparing the tastiest, dynamic and creative meals. The Crystal Dining Room offers exceptional menus of classic favorites that are served alongside a selection of progressive Modern Cuisine specialties. Ship’s specialty restaurants provide an opportunity to enjoy comfort food in a relaxed and comfortable ambiance. Crystal Serenity restaurants promise to delight and surprise even the most discriminating palate. Passengers of all ages and personalities are catered for upon the Crystal Serenity. Thanks to the variety of lounges, casinos and clubs you will always have something to do after the dinners. You can end the day with a few drinks and enjoy live music performances. As the strains of everyday life can be too much, it is worth going to the Crystal Spa where you can try out a number of wonderful treatments including facials, massages, body wraps, manicures and etc. Take a cruise with Dreamlines. For more information on the itineraries and cruise deals take a look through the offers on the right or call our cruise experts at 1-888-403-1425.